“Justin Kluivert completes Roma move,” declares the Manchester Evening News in its “live” blog of “Manchester United transfer news”. Ciaran Kelly is scathing of the fools who thought Kluivert was heading to Old Trafford. Amazing how that friendly word at the end of the Europa League final between him and Mourinho, who knew him as a kid from his time at Barca, sparked hundreds of articles and rumours. Justin Kluivert’s dad advises him over Manchester United transfer – Justin Kluivert has been advised to snub a move to Manchester United by his dad Patrick. Mentions of Manchester United: zero. 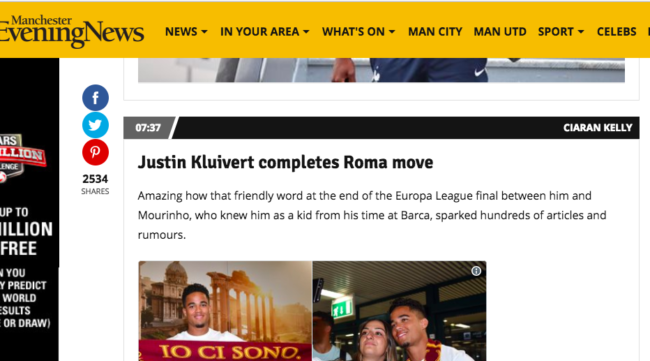 The Manchester Evening News writes lots of story linking Justin Kluivert to Manchester United and then tells readers on the day the player signs for Roma it knew they were all utter balls. Local paper treats its readers like mugs. Nice.